Wouldn’t you LOVE to get in the best shape of your life with a workout you can stick with? Introducing MDfitness. 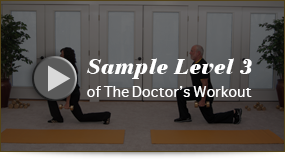 I'm Dr. Tom Kleeman, an Orthopedic surgeon and originator of MDfitness, the Doctor's Workout. Along with my wife Anne, we've created a safe, effective, and balanced exercise program that will transform your life. Our program consists of three levels of varying intensity including cardio, weight training, and balance moves to target age-related muscle loss. 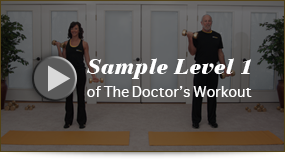 Regardless of your age, gender or current fitness level, the doctor's workout is designed for you! For beginners and to familiarize yourself with our program. Graduating to Level 3 will keep you fit and transformed! Our next step, for those who have comfortably mastered Level 1. 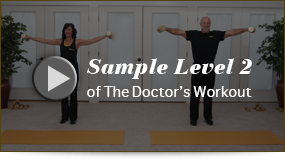 The Doctor's Workout is a fun and effective method to improve your fitness quickly and keep you in shape. MDfitness is a complete program that is easy to follow and can be done virtually anywhere. Commit to our program and we KNOW you will see a change in your body and your ability to enjoy life. I know you're busy, we all are... but if you dedicate just 40 minutes to yourself, 3-4 times a week, you will be rewarded beyond your expectations. At 64, I am in better shape than when I was 54, maybe even 44! MDfitness has changed our lives and I know it will change yours too! We focus on functional fitness, using everyday moves to help you gain strength and enhance your ability to enjoy life. Simply the best investment you can make for your future! Free eBook of recipes to complement and enhance our program with every purchase!